Crossfire Client, Trunk: Server->Client map command functions. Definition at line 2046 of file commands.c. Definition at line 2196 of file commands.c. References GetChar_String(), mapdata_cell(), mapdata_contains(), MapCell::need_resmooth, pl_pos, MapCell::smooth, PlayerPosition::x, and PlayerPosition::y. Definition at line 2296 of file commands.c. References cpl, draw_magic_map(), LOG(), LOG_WARNING, Player_Struct::magicmap, Player_Struct::mmapx, Player_Struct::mmapy, Player_Struct::pmapx, and Player_Struct::pmapy. Definition at line 2053 of file commands.c. References display_map_doneupdate(), FACE_IS_ANIM, GetShort_String(), LOG(), LOG_WARNING, MAP2_COORD_OFFSET, MAP2_LAYER_START, MAP2_TYPE_CLEAR, MAP2_TYPE_DARKNESS, mapdata_clear_old(), mapdata_clear_space(), mapdata_scroll(), mapdata_set_anim_layer(), mapdata_set_check_space(), mapdata_set_darkness(), mapdata_set_face_layer(), mapdata_set_smooth(), mapupdatesent, MAX_VIEW, and MAXLAYERS. Scrolls the map on the client by some amount. Definition at line 2166 of file commands.c. References display_map_doneupdate(), LOG(), LOG_WARNING, and mapdata_scroll(). Handle MapExtended command Warning! if you add commands to extended, take care that the 'layer' argument of main loop is the opposite of the layer of the map so if you reference a layer, use NUM_LAYERS-layer. Definition at line 2234 of file commands.c. 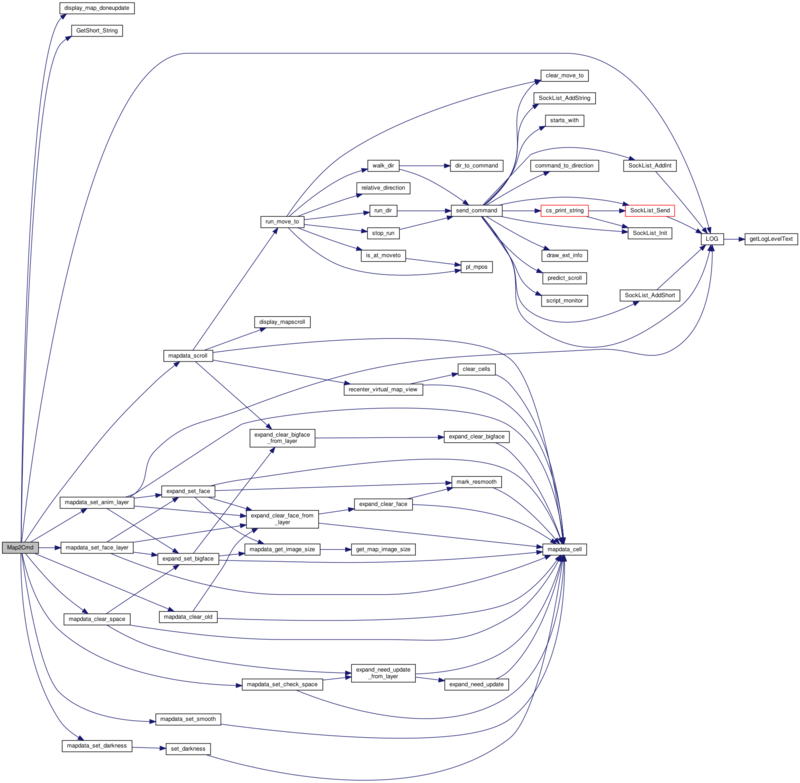 References display_map_doneupdate(), EMI_HASMOREBITS, EMI_NOREDRAW, EMI_SMOOTH, ExtSmooth(), GetChar_String(), GetShort_String(), mapupdatesent, and NUM_LAYERS. Definition at line 2027 of file commands.c.